← Canon U.S.A. Introduces The Highest Image Quality Powershot Digital Camera, The G1 X.
Nikon Announced the Nikon D4 – The DSLR for Professional. TOKYO – Nikon Corporation is pleased to announce the release of the Nikon D4, a Nikon FX-format camera that serves as the new flagship model in Nikon’s lineup of digital-SLR cameras. Nikon will be exhibiting the D4 at the 2012 International CES, to be held Tuesday, January 10 through Friday, January 13 in Las Vegas, Nevada. This electronics exhibition is open to the public. The new 91K-pixel (approximately 91,000 pixels) RGB sensor supports the Advanced Scene Recognition System, which is able to recognize human faces even when images are framed using the optical viewfinder. In addition, the Advanced Scene Recognition System offers significant improvements in AF, AE, i-TTL flash control, and auto white balance (AWB) control accuracy. The 51 focus point AF system has been improved with faster initiation of autofocusing and the ability to detect and focus on subjects with less lighting. In addition, 11 focus points are fully functional when lenses with a maximum aperture of f/8 are used. All of this means more precise autofocusing when super-telephoto NIKKOR lenses are used with teleconverters (2.0x). The Multi-area Mode Full HD D-movie movie recording function is capable of recording full-HD movies at 30 fps, and offers three movie recording formats for selection according to recording conditions or creative intent. What’s more, the D4 records images to memory cards faster with built-in support for high-speed, UDMA 7-compatible CompactFlash memory cards and next-generation, high-speed XQD memory cards. In addition to built-in wired LAN features, the D4 also supports high-speed image transfer via wireless LAN when the new, compact, easy-to-use Wireless Transmitter WT-5 (available separately) is connected to the camera. The D4 is also equipped with a number of new functions that support a more efficient workflow for professional photographers, including one that allows users to add IPTC (International Press Telecommunications Council) information to images. In 2007, Nikon released the D3 digital-SLR camera as its flagship model equipped with the new FX-format CMOS image sensor developed by Nikon. With its new image sensor, the D3 established a new level of image quality, speed, and support for high sensitivities. In December of 2008, Nikon released the D3X with an effective pixel count of 24.5-million pixels, which enabled superior imaging performance equal to that possible with medium format cameras. In the following year, the D3S proposed new possibilities in imaging expression with its expanded range of standard sensitivities from ISO 200 to ISO 12800 and a built-in movie recording function. The superior performance of the Nikon D3 was recognized with three of the most prestigious domestic and international awards—Japan’s Camera Grand Prix Camera of the Year and Europe’s Technical Image Press Association’s (TIPA) Best D-SLR Professional and the European Imaging and Sound Association’s (EISA) Professional Camera of the Year. The D3X and D3S continued the success of the series introduced with the D3, being recognized by the camera industry for their superior performance with a number of awards of their own as well as extreme popularity with professional and advanced amateur photographers alike. In addition, the superior durability and reliability of the cameras has also been recognized by NASA, which ordered several models as-is, with no special modification, that are currently used aboard the International Space Station (ISS). Support for an incredibly wide range of sensitivities, from ISO 50 to ISO 204800The D4 is equipped with a new Nikon FX-format CMOS image sensor (imaging size of 36.0 x 23.9 mm) developed by Nikon. The superior performance of the FX-format CMOS image sensor with its effective pixel count of 16.2-million pixels offers excellent resolution and image quality under an incredible variety of lighting conditions. Despite the increase in pixel count, the D4 reads out data faster than the D3S. The range of standard sensitivities has been expanded to ISO 100 to ISO 12800. What’s more, support for ISO 50 and additional expansion up to ISO 204800 is also possible, enabling effective shooting under a variety of lighting conditions without concern for any sacrifice in image quality. New EXPEED 3 image-processing engine with superior, high-speed processing capabilitiesThe new EXPEED 3 image-processing engine built into the D4 offers better image quality and even faster processing speeds for vivid yet faithful color reproduction, a broader dynamic range, and rich expression of tones. It also effectively suppresses noise with advanced noise-reduction processing for images captured at high sensitivities under dim lighting, all while preserving definition and sharpness. Noise-reduction processing designed especially for movies maintains crisp, clear outlines in movies recorded in low-light situations. EXPEED 3 has high-speed processing capabilities for a variety of task, and it uses power effectively, contributing greatly to the camera’s power-saving design. 91K-pixel RGB sensor for the more accurate Advanced Scene Recognition SystemThe D4 is equipped with the Advanced Scene Recognition System, which supports face recognition* when images are framed using the optical viewfinder. The new 91K-pixel (approximately 91,000 pixels) RGB sensor recognizes human faces for more frequent focus acquisition on human faces when Auto-area AF AF-area mode is used. When a human face is detected in the frame, 3D Color Matrix Metering III bases exposure control on the brightness of that face so that the face is optimally exposed even with backlighting. In addition, the high resolution of the metering sensor with its roughly 91,000 pixels enables extremely precise analysis of the scene for more accurate control over autofocusing, auto exposure, i-TTL flash control, and auto white balance. Faster and more accurate AF with 51 focus pointsThe 51 focus point AF system built into the D4 utilizes the new Advanced Multi-CAM 3500FX autofocus sensor module for faster, more accurate autofocusing that performs extremely well under dim lighting. The 15 focus points at the center of the frame are cross-type sensors that detect phase differences both horizontally and vertically. All 51 focus points are fully functional when lenses with a maximum aperture of up to f/5.6 are used, and the cross-type sensors make the most of this capability. Precise focus can be quickly acquired with autofocusing using all AF NIKKOR lenses, even under lighting as dim as −2 EV (ISO 100, 20°C/68°F), the level at which the scene through the viewfinder can just be made out by the human eye. What’s more, 11 focus points (five at center with an additional three to each side) are fully functional when lenses with a maximum aperture of f/8 are used. This enables very precise focus acquisition with sports photography and the like when super-telephoto NIKKOR lenses are used with a teleconverter (2.0x) at a combined aperture value of f/8. Multi-area Mode Full HD D-movie with three image area optionsA dedicated movie-record button has been positioned near the shutter-release button for smooth starting and stopping of movie recording with a feel similar to that of still-image shooting. Full-HD movie recording at a frame size of 1920 x 1080 and frame rate of 30 fps is supported, and the H.264/MPEG-4 AVC video compression method has been adopted. Movies up to 29 minutes 59 seconds*1 can be recorded. Image sensor sensitivity begins at ISO 200 and can be expanded to the same ISO 204800 equivalent possible with still-image shooting. Full-HD movies can be recorded with the D4 using one of three image areas: FX-based movie format*2, DX-based movie format, or 1920 x 1080; 30 fps/25 fps/24 fps crop. FX-based movie format makes full use of the large image sensor, enabling movies with an emphasis on pleasing blur characteristics. When a DX lens is attached, DX-based format is automatically selected. This format is useful for creating an extension to the local length of an existing lens. For an even stronger telephoto effect, the 1920 x 1080 crop format brings an approximately 2.7x crop of the picture angle while delivering outstanding video quality and detail, obtaining 1080p Full HD. By choosing the movie format appropriate for the particular scene, the three image area options available with a single camera enable more flexible imaging expression through collaboration with the entire NIKKOR lens lineup, including DX lenses. Smooth workflow from initial setup to image transferThe entire photographic workflow is faster with the D4. Superior, high-speed response with a power-up time of approximately 0.12 s*1 and a release time lag of roughly 0.042 s*1. In addition, support for high-speed, next-generation XQD memory cards enables a continuous shooting frame rate of 10 fps for up to approximately 100 shots even with shooting in RAW format*2. The camera is also equipped with dual memory card slots, one for XQD memory cards and one for CompactFlash memory cards, for smooth handling of images. What’s more, professional photographers can work much faster with high-speed transfer of images to a computer when an XQD memory card reader supporting SuperSpeed USB (USB 3.0)*3 is used. The D4 is equipped with an Ethernet port and functions for wired LAN connections. 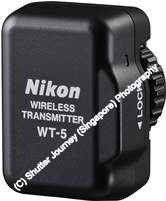 In addition, it also supports the new WT-5 (available separately), a compact wireless transmitter that is easily connected to the camera for high-speed transfer of images over a wireless network. * The D4 is also equipped with a number of new functions that support a more efficient workflow for professional photographers, including one that allows users to add IPTC (International Press Telecommunications Council) information to images. The new WT-5 is powered by the camera, making a more compact size possible. In addition to IEEE 802.11a/b/g standards, the WT-5 also supports the new IEEE 802.11n (1 x 1) standard, enabling data transfer at twice the speed possible with the WT-4. The camera’s HTTP server mode can be used to display a list of images stored on the memory card, and also enables basic camera control, live view, movie recording, etc. using the Web browser on a computer or smartphone. Synchronized release (WT-5 only) mode enables synchronized shutter release of up to 10 cameras D4 cameras, each with its own WT-5) with the D4 used as the controlling “master”. Capture NX 2 Ver. 2.3 for significantly faster processingA trial version and free upgrade for Capture NX 2, Nikon’s image editing software, were released on December 20 to coincide with release of the D4. This latest version is Capture NX 2 Ver. 2.3. In addition to offering image editing functions that allow users to achieve the intended results with intuitive operation, a faster image-processing algorithm has been adopted for much faster processing. What’s more, operation is smoother and more natural with the addition of native compatibility with 64-bit operating systems. This entry was posted in Brand: Nikon, Photography Articles & Videos, Uncategorized and tagged DSLR, Nikon. Bookmark the permalink. 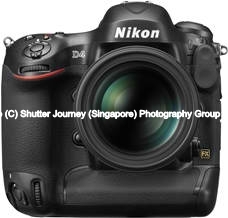 1 Response to Nikon Announced the Nikon D4 – The DSLR for Professional.